"Shining tempters formed of air, symbols of desire..." Aristophanes, 419 B.C. reece. Ravenna, Italy is the center for the most exqusite Byzantine mosaics. 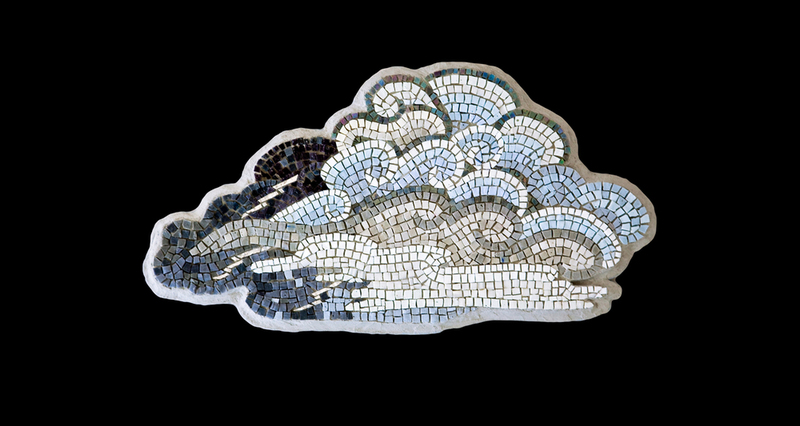 My series of cloud mosaics reflects my experiences at Luciana Notturni's Ravenna Mosaic Art School and immersion in that beautiful city's wealth of mosaic art. Luciana says "Some people travel to see works of art, others to make them." What a delight to do both in Ravenna. As Aristophanes dramatizes in his play, The Clouds, these images are heavy with symbolism. louds can imply spirituality and peacefulness, or suggest softness and comfort. They can represent ever-changing reality, hide the sun, foretell rain, and have a silver lining--all at the same time. And more recently they take on a role in that great computer in the sky. My clouds are created with hand-made Italian glass smalti and 24 karat gold tesserae from the Orsoni foundry in Venice, Italy. I cut the mosaic glass using the traditional ammer and hardie. They are cast into thinset mortar using the double-reverse technique I learned in Italy. Yet they are light-weight enough to hang on a wall, and come prepared with secure wires.